My hand was becoming numb. I dipped the asperses wand into the holy water bucket again, twirled to take up water, then lifted the wand and continued to flick the sacred liquid left and right, as the Procession winds through the streets of the Logan Barrio in Santa Ana, California. Holy drops fall on invisible seeds of Grace. A cloud of sweet incense enfolds me, the thurible swinging side-to-side right behind me. Behind the thurifer, Father Ed Becker, the pastor of St. Joseph’s Roman Catholic Church, held a heavy, gold monstrance, bearing the sacred host of the Body of Christ. It is Palm Sunday afternoon and this is the 20th Annual Blessing of the Streets. About 20 years ago an altar boy from St. Joseph’s lay dying at the curb, across the street from the church, shot by local gangsters. I remember those days. The sound of pop pop pop was almost a daily event in our area. Something had to be done. My Episcopal parish, Church of the Messiah, located two blocks west of St. Joseph’s, began to work with the local police department and St. Joseph’s in developing community based policing. My good friend, Father Christopher Smith, then pastor at St. Joseph, initiated this Blessing of the Streets as a way for local churches to witness our neighbors that Jesus was here in the streets and we are here as peacemakers. “Again Jesus said, ‘Peace be with you. As the Father has sent me, I am sending you.’ “ (John 20:21). Father Ed embraced the sorrowful mother as waves of grief passed through the attentive crowd. Traffic marshals held back cars coming off busy streets, as our procession continued. We were walking in the middle of a broad, tree-lined street, through avenues of four story high, densely packed apartments. One of the most densely populated neighborhoods in America. Each three-bedroom apartment usually housed a whole family in each bedroom. Poverty, gangs, drugs, family violence and vulnerable children. The sidewalks filled with curious neighbors. In most of America, a public procession like this would seem strange. What is going on? However, in this city with the highest percentage of native Spanish speakers in America, this procession would remind them of their hometown in El Salvador or Mexico. And they recognized the Body of Christ. Jesus was here. But there was another presentation of the Body of Christ, in these 500 faithful souls, walking together, children and mothers, fathers and grandparents. They are also the Body of Christ. We visited and blessed another shrine for a murdered teenager and one for a little girl killed by a hit and run driver. Life is precarious and precious here. How many of these people have experienced gang violence within their own family? Together we are a strong spiritual presence exorcizing the evil spirits lurking in the shadows. Holy drops fall on invisible seeds of Grace. 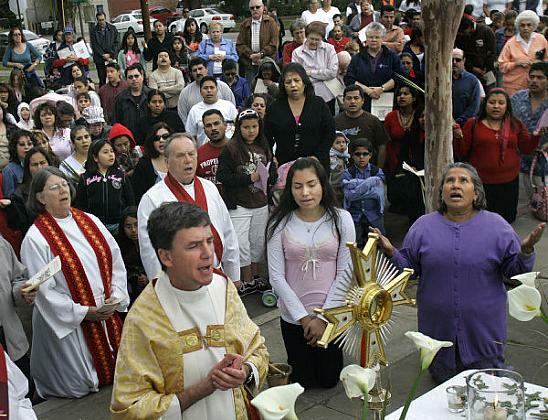 The first Blessing of the Streets twenty years ago was the beginning of a creative, spiritual synergy of the local downtown Santa Ana churches to create life and hope in the impoverished 92701 Zip Code. Sister Eileen McNerney, of the Sisters of St. Joseph of Orange, founded Taller San Jose, at the corner of Civic Center Drive and Broadway. Initially creating a woodworking workshop to make colorful benches out of old doors from the remodeled Mother House of the Sisters, Taller San Jose evolved into a complex training program for medical assistants, office workers, and construction tradesmen like plumbers and electricians. St. Joseph’s and Messiah Parish launched afterschool tutoring programs for junior and senior high youth (more than half of neighborhood youth were dropping out of school by 9th grade). This evolved into THINK Together, now one of the largest afterschool programs in the USA. My parish with the Sisters of St. Joseph founded Hands Together, a Center for Children, providing nationally accredited high quality early childhood education for the poorest children in Orange County. This evolved into three learning centers, including a program for homeless mothers and children. Mercy House built a state of the art hospice for homeless men and women with HIV AIDs. St. Joseph Ballet, founded at my parish, developed self-esteem in young Latinas through training in traditional ballet and folklorico, growing into one of the outstanding youth arts programs in America. I retired 18 months ago as pastor of Messiah Parish and missed the Blessing of the Streets last year. As I walked again with my old neighbors, my good friends at St. Joseph’s parish, I sang again the canticos that we often sang at mass at my old church. Children held up intricately decorated folk art pieces of palm branch bearing the image of Jesus. Mothers held hands with their child and sang the canticos from a place deep in their heart, tenacious faith and hope for the future of their precious ninos. I felt like I had returned to my spiritual home, walking on the streets where people fight and struggle for a life for their families, but bearing a deep faith in the risen Jesus who walks with us today breathing peace over all of us. This entry was posted in Blog and tagged Body of Christ, gang violence, Hands Together a Center for Children, Latino immigrants, Logan Barrio, Palm Sunday, Santa Ana, Sisters of St. Joseph of Orange, spirituality, St. Joseph Ballet, Taller San Jose, Think Together. Bookmark the permalink. May you have a Blessed Holy Week and a Joyous Easter! I love that this post brings such a message of hope even as the tears of grief stream down my face. Thank you for being the face of Jesus to that hurting neighborhood. May your Holy Week and Easter be truly blessed, even as you bless those around you. Such a beautiful sign of hope and consoling love in the midst of so much pain, this procession. Living in the quiet of suburbia, it is easy to forget the daily struggle our brothers and sisters in Santa Ana face. Thank you for this moving blog entry, Fr. Brad. Look forward to seeing you again soon. Confidentiality Notice: This email and any attachments are confidential and may be the subject of legal professional privilege. If you are not the intended recipient, any use, disclosure or copying of this document is not authorized. If you have received this document in error, please immediately notify the sender by email or telephone and delete this email from your computer. Thank you for your cooperation and courtesy. Note: Please do not communicate urget clinical material via email. Wow! Takes me back to when I participated in this event years ago when I lived off ‘Church’ Street, sure do miss Messiah parish! This reading brought back wonderful memories! Thanks for sharing! Thank you for another beautiful reflection. It is especially appropriate for the Triduum. Blessings on your Easter. Dear Fr. Brad: What a beautiful and inspiring article!